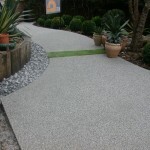 What is or are resin aggregate driveway benefits – where do we start? Choice of colours and finishes. That’s quite a list for resin aggregate driveway benefits. Whether your existing surfaces are concrete, tarmac or imprinted concrete and even slabs in some cases, resin bonded stone can be applied. To elaborate a little on the above benefits – Suds Compliance for eg. Our clients very often believe that they must have a permeable surface to be Suds Compliant. This is not the case. What the Suds Compliance requirement is, is that “run off water is managed”. As simple as that. That could mean the surface area you already have is Suds Compliant. In addition this only applies to front gardens! 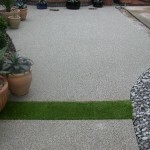 Resin aggregate driveway benefits can enhance, protect and extend the life of your existing surface. What a lot of clients do not realise is that that surface they already have may not look very nice but a lot of the time this can be surface damage only. In the case of concrete it is an extremely versatile product and has been around for years. Concrete as a base to for weight bearing purposes is a product that is hard to beat. So whether you are in Mansfield, Wellow, Ollerton, Ilkeston, Ripley, Stonebroom, Alfreton, Sbirebrook. Derbyshire, Nottinghamshire or Leicestershire. Call us for a free no obligation chat. We can send you some information out, or call out and quote. 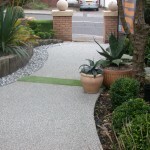 Don’t forget your driveway path or patio can enhance your garden. 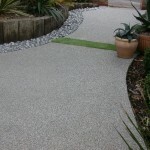 If you have a block paved edge no problem one of the resin aggregate driveway benefits is that it does not affect existing levels. Ring Simon or Faith for honest advice. So take advantage of the resin aggregate driveway benefits which can extend the life of your concrete, imprinted concrete tarmac or slabs. 01623 623986. This entry was posted on Wednesday, October 29th, 2014 at 8:04 am	and is filed under Block Paving, Chesterfield, Concrete, Derbyshire, Diary of a Mansfield Resin Driveway Company, Driveways, gardens, Imprinted Concrete, Latest News, Lincolnshire, Mansfield, Paths, Patios, Paving Slabs Resurfacing, Resin Bonded Aggregate, Resin Bonded Driveways, Resin Bonded Gravel, Resin bonded path, Resin Bonded Patios, Resin Bound, resin drives, Tarmac and Asphalt. You can follow any responses to this entry through the RSS 2.0 feed. Both comments and pings are currently closed.